The towering stalks of the okra plant provide height, texture, and color to the home garden. 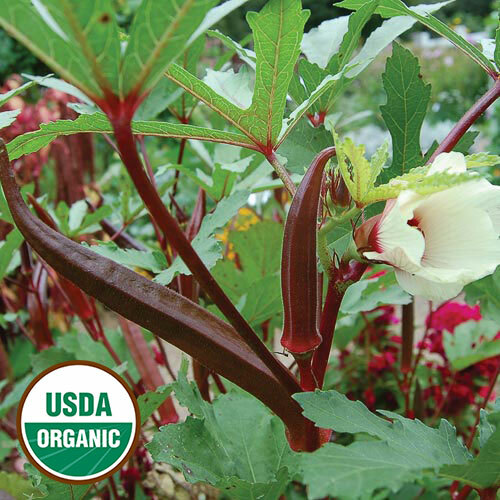 Both beautiful and productive, okra can be harvested for several weeks throughout the summer. Because okra germinates and grows best when planted in soil that has warmed above 80 degrees F, northern gardeners often start seeds in flats and transplant seedlings when the weather heats up. In warmer regions of the country, seeds are often direct-sown. Nicking the seed coat of okra seeds can help improve germination rates. Sow okra seeds ½ inch deep. When direct-sowing okra, space seeds 2 inches apart and thin to a final spacing of 12-18 inches apart. 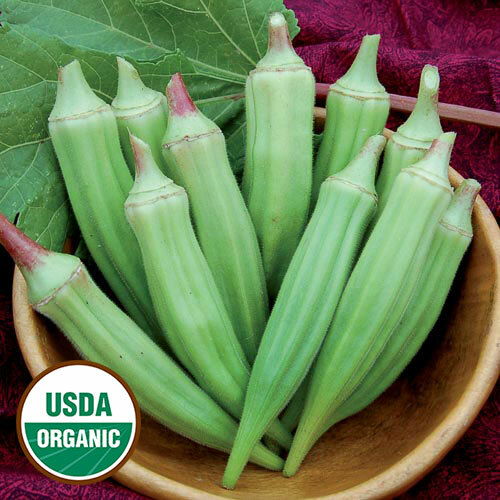 Okra develops best in warm climates with warm nights, preferring temperatures between 68 and 95 degrees F.
Okra can suffer from several pests and diseases, including cucumber beetles, white mold, Southern Blight, vascular wilt, bacterial spot, and powdery mildew. Growers in southern states should also protect against root knot nematode infestation. Okra pods are harvested for eating when they are young and immature, just after the flowers fade. Okra pods can be harvested every few days with pruning shears or a sharp knife. If pods are longer than 5 inches, they might be tough, though there are some varieties that grow longer than others and these may still be tender. Refrigerate okra pods after harvest. Okra pods can be cooked just after harvest in stews, gumbos, or as a fried side dish. If you want to prolong this summer treat, okra pods can also be pickled, or steamed and frozen. Okra lasts less than a week in the refrigerator. Well suited to tropical and subtropical climates, okra is often associated with the Deep South, but it can be cultivated - even to seed maturity - throughout much of the United States. And okra’s ability to self-pollinated makes it a suitable crop for beginner seed savers, provided it receives the heat that it needs to flower and set seeds. Separate varieties by 500-1,600 feet. To ensure viable seeds, save seeds from at least 1 plant. When maintaining a variety over many generations, save seeds from 5-10 plants. 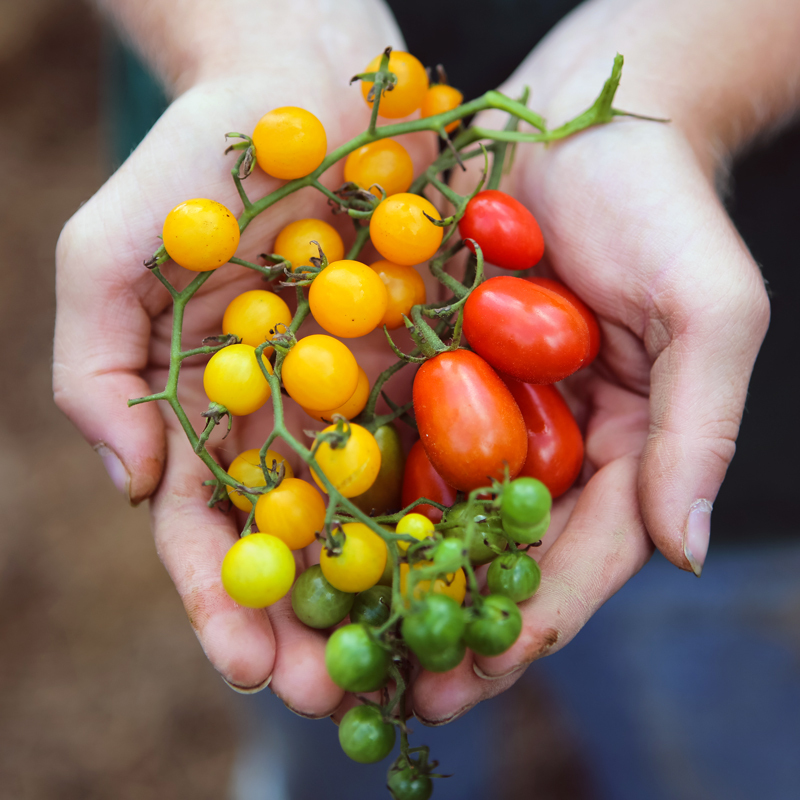 If you’re saving seeds for genetic preservation of a rare variety, save seeds from 25 plants. Okra pods continue to increase in size when left on the plant beyond the edible stage. Once the seeds inside are fully developed, the pods will begin to dry and should be harvested when they turn brown and brittle. 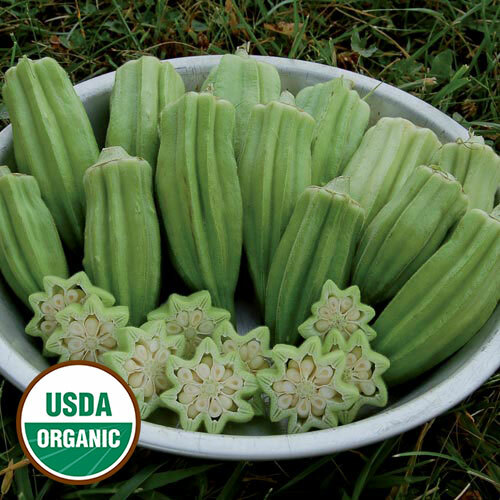 Just as the solitary flowers of okra open at different times, beginning at the base of the plant and progressing upward, so do pods mature in this same pattern. Individual fruits should be clipped from the plants as they mature and moved to a protected location. Pods can be laid out to dry on screens or landscape fabric, or they can be hung in mesh bags; they should be left to dry until they become brittle. Wearing gloves while harvesting and cleaning these spiny fruits helps prevent skin irritation. Because okra seeds are large, they can be easily threshed by hand. Break the okra pods with your hands and work them until they release seeds. The stem end of the fruit can also be cut with a pruning sheers, allowing the seeds to pour out. The large seeds of okra are easy to separate from the chaff through screening and winnowing. Store okra seeds in a cool, dark, and dry place protected from pests. When stored in these conditions, okra seeds will remain viable for 1-3 years.